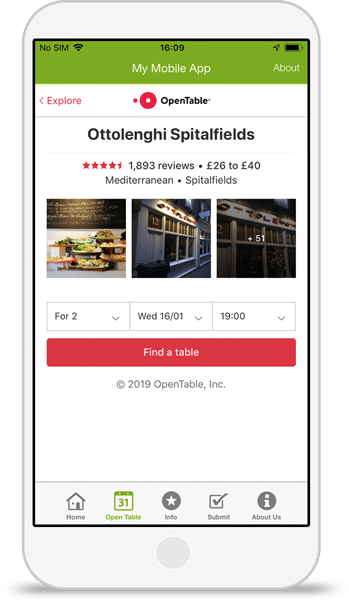 Booking a table is even easier when you integrate your Open Table account within your app. Connect your account to let customers book with just a few taps from their phone. The Restaurant App template contains everything you need to showcase your menu and promote offers. Add your logo and pull in branding by simply entering your website URL. Add the OpenTable tab to allow app users to easily book a table through your OpenTable page. Launch your OpenTable app in minutes with our simple publish wizard.